Next year will be the make-or-break year for the new president, whose honeymoon period is almost over. The Iranian public’s patience is not infinite. Rouhani must remember the experience of former President Mohammad Khatami, who captured the popular imagination in 1997 with a call for dialogue of civilization and rhetoric of reform. The Iranian public held out for hope and change until 1999 when, against the backdrop of repeated newspaper closures and an attack by security forces on a student dormitory, the public rose up in what was then the largest anti-government protest in Iran since the revolution. I was in Tehran at the time and witnessed the aftermath. Ordinary Iranians gathered in homes, storefronts, and hotels to watch a speech by Supreme Leader Ali Khamenei in reaction to the protests. They hoped he would call for justice and endorse reforms. Instead, he castigated protestors and threw his support wholly to the security forces that had been so abusive in previous days. Iranians hoped Khatami would speak up for their rights, but the smiling reformist remained silent as security forces detained thousands, and subjected hundreds to humiliating abuse. It was at the point, Iranians realized, that their hopes in Khatami were premature at best – if not entirely misplaced. The Supreme Leader and old guards’ self-interest were simply too great to overcome. Khatami, like Ahmadinejad after him, became a lame duck. This is by design. The Supreme Leader prefers not to eliminate rivals, but to weaken them to the point of impotence. Rouhani’s time is limited. Not surprisingly, cynicism in Iran is rife. Iranians might have embraced Rouhani, but their patience is not infinite, especially given the gap between public expectation and policy reality. Rouhani’s record of reform has been inconsistent at best: While he won the release of some prominent internal dissidents, security forces continue to arrest others. The regime has increased the frequency of public executions, apparently to ensure that ordinary citizenry do not confuse diplomatic outreach abroad with lessened commitment to revolutionary ideology at home. The symbolism of the regime’s refusal to allow Khatami to travel to Nelson Mandela’s funeral, effectively continuing its ban on his travel, was not lost on the Iranian public. Iranians also wait to see whether Rouhani will fulfill his promised to repair Iran’s moribund economy. According to the Statistics Center of Iran, the Iranian economy shrank 5.4 percent over the past year. While inflation officially hovers around 30 percent, the Iranian Central Bank’s price index of foodstuffs shows staples such as vegetables, rice, fruit, meat, and tea have increased between 50 and 70 percent. Sanctions relief may not provide the relief many Iranians seek: While sanctions have impact, it is an open secret among Iranians that the real reason for the Iranian economy’s poor performance are statist policies, poor management, and an undisciplined and populist subsidy policy. The coming year will show definitively where Rouhani stands on investment priorities. The December 14 announcement by the Oil Ministry that average oil revenues have been $11 above the $92 per barrel assumption upon which Iranian officials set the budget forces a decision about what to do with that surplus. Should such money be siphoned off for the nuclear program, military projects, or to support Hezbollah or pro-Assad militias in Syria, then it would suggest that Rouhani is unable or unwilling to bring change. There is precedent for such disappointment. During Khatami’s second term, Iran’s trade with the European Union nearly doubled while simultaneously the price per barrel of oil skyrocketed. Rather than invest the hard currency windfall in the Iranian economy, the lion’s share went to Iran’s then-covert nuclear and ballistic missile program, suggesting either Khatami’s insincerity or the possibility that he had been sincere, but did not hold the reins of power. Rouhani might be sincere, and he may genuinely desire to resolve Iran’s myriad internal problems and external crises. But Iranian presidents are most powerful on inauguration day, and quickly lose power with the passage of time. Nor are reformists democrats or liberals as they are so often depicted abroad; they subscribe just as fully to the theocratic system, but simply want to tweak its implementation. The Iranian people and international community might hope for change, but 2014 might very well be the year when they conclude the emperor has no clothes. How both Iranian and Western diplomats react to unmet expectations and Iranian business as usual will be the 64 million rial question. a lot of gas here from michael rubin. 1- It was not real election last year. Supreme leader announced 6 persons that he trusted and ask Iranian vote to one of those! For example Hassan Rouhani was security adviser of supreme leader for over 17 years! Iranian voted to bad against the worst because there was no other option! 2- The country is under control of supreme leader and his Islamic Revolutionary Guard Corps (IRGC) with gained unprecedented political and economic power and nothing changed even after assigning of Rouhani as president. 4- The regime spend Billion of dollars for extreme groups in Iraq, Egypt, Afghanistan, Bahrain and Syria and Lebanon to get the control of region and also has big plans for rocket and bomb..
5- The Iranian people hope for real changes not cosmetic changes by reformists. Mohamad Khatami failed once in 8 years ago. Neda, you absolutely right! This barbaric regime has no plce in 21century .you can't expect Mullah to act and behave in 21century manner. iran's supreme leader gave iranians a choice of 6 candidates. all iranians. in america our supreme leaders give us a choice of 2. both the same. neither american. spends only billions to protect the region. our "leaders" spend trillions to destroy the region. do i need to talk about rockets and bombs? american "leaders" dont even waste time with cosmetic changes. How does an Israeli troll like you know what Iranians want? Zionism is the problem that needs to get fixed in this world. i talk to iranians – in iran- not the westernized traitors. Another pile of nonsense from the Zionist mafia. They seem to come from any corner. I just read the book Goliath by Max Blumenthal. An eye opening report as to what Zionism has become and done. People like Rubin want to extend the same ideology worldwide. Roger Waters is right. Time to confront them and expose this mafia.
. Iran is quite simply a religious theocracy with Khamenei as its religious and secular head. Religiously supervised government is by its very nature irrational since the decision making process rests on an interpretation of divine will. Similarly, if the head of the Conference of Baptist Churches had veto power over Congress and the President, I’m sure virtually everyone would be soiling their pants. So we are faced with a dilemma. We are negotiating with a nation who’s religious outlook has brought it into conflict with other Muslims, Christians, Jewish and Hindus. Probably Wiccans as well. 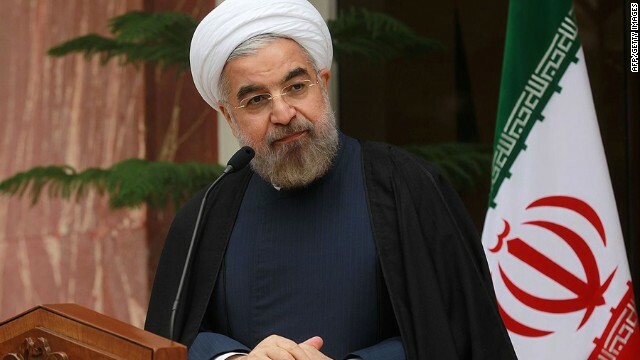 Obama bring nuclear bomb as Christmas gift for Rouhani! where tired Iranian from the regime have been hanged/killed by the supreme leader!. Both Ahmadinejad and Morsi had made the same mistake and they must have regretted it retrospectively. They ceded too much economic power to the military, which later stabbed them in the back. The military both in Egypt and Iran had a budget, that was not subject to scrutiny and many officials enrich themselves with their clandestine activities. Indeed, it's uncertain how long Supreme Leader Ayatollah Ali Khamenei will back Rouhani. Hardliners dominate among the clerics and military, and they are messianic believers in their nuclear capabilities. Rouhani is aware of the tightrope he is treading. He has to warm Iran's ties with the West, while also knowing any mistake or provocation is fodder for the Revolutionary Guard and others, who might reap advantage from a crisis. I had to focus on the word "messianic" twice because it kept on coming through as "maniacal". Perhaps I had better lay off the egg nog. II would not trust the Iranians. Since the Iranian Revolution on February 11, 1979 the Iranians have installed a barbaric terrorist government that only desires to make the world miserable. Iran is a disgusting place. And Iran has always been a troublesome place. The Shah of Iran, according to a Mike Wallace 60 minutes episode was an unreliable U.S. ally. The Shah ruled Iran from 1941 until 1979. It must be noted that the United States returned the Shah to power in 1953. The Shah's Prime Minister revolted in 1953. The revolt was crushed within a few days by the Shahs forces in Tehran. And the Shah was flown into Tehran once again to rule until the disgusting Iranian revolution. And the Shah that was sent iinto exile in 1979 was the successor of his father's rule. Reza Khan ruled Iran from 1925-1941. Reza Khan became king of Iran with the aid of the British. Reza Khan was so ungrateful that he sided with the Nazis in World War 2. Reza Khan was removed from power in 1941 by the United States and the United Kingdom. Reza Khan usehered in the Pahlavy dynasty which was a 100% dictatorship. And the dynasty was replaced by the Islamic Republic of Iran dictatorship. Iran is a disgusting place. Iran has been a disgusting place for many years. Its retards like you that makes all the middle east hate Jews/westerners. Reza shah was not installed by the British. The British and the Russians always held Iran down. Reza shah replaced a non-functioning monarchy and brought Iran under control. The prime minister of Iran stood up against the shah in 1953 because the British/Americans were getting 80% of the oil revenues pumped in Iran. Operation Ajax, a us and Uk sponsored regime change, brought the monarch back. So before you say Iran is disgusting and manipulating facts to fit your Zionist agenda I suggest you read a book on Iran and realize that in the last 100 years Iran has not started a war but compare that to peace loving Israel who kills civilians and calls them terrorists. You might as well not bother reading anything about Iran and Rouhani when the author, right from the start, makes the obvious mistake of calling Rouhani a reformist. He's not. He has no interest in changing the governing structure of the Islamic Republic. He just wants to ease tensions between Iran and the West and to loosen the harshness of Iran's social prohibitions. So a moderate, yes; a reformist, no.